It took one week for the GOP establishment to torpedo Kevin McCarthy's bill to fully fund the border wall. Paul Ryan has already walked back his promises. Instead of promising to fully fund the wall, he is now simply promising to "have a full-fledged discussion" over wall funding. Pathetic. McConnell has also declared that McCarthy's bill to fully fund the border wall is dead on arrival in the Senate. 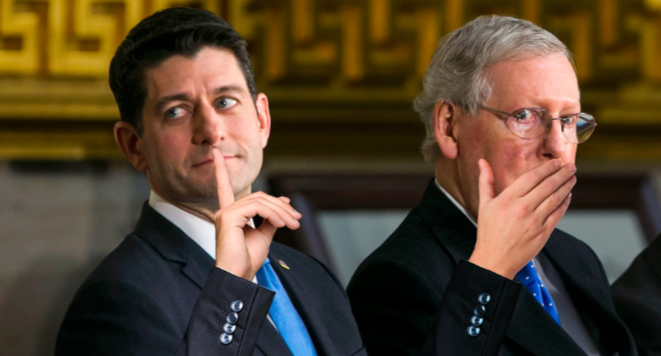 McConnell will only approve $1.6 billion for border security, with next to none of it going to new border wall construction. Pathetic. They are surrendering right now. Please, do not let this happen! Please, send your instant FaxBlast to Congress before it's too late! Tell them that if they do not fully fund the border wall, you will remove them from office! It took less than a week for Congress to settle back into its cowardly ways. Fresh off of the Kavanaugh victory, House Majority Leader Kevin McCarthy introduced a bill to fully fund President Trump's border wall, as promised. Not only would his bill set aside $23.4 billion for border security and wall construction, but it includes Kate's Law, a ban on sanctuary cities, a provision to expedite illegal alien gang member deportations, and resolutions defending ICE and opposing illegal alien voting. McCarthy's Build the Wall, Enforce the Law Act is so common sense, it is amazing that Congress has left these gaping holes in our immigration system for so long. And the bill does not include any amnesty provisions. This isn't about political horse trading. This is about protecting the American people once and for all. As I said, it took less than a week for the GOP leadership to come out against McCarthy's plan. Instead of guaranteeing border wall funding, Paul Ryan is now simply promising that the House will "have a full-fledged discussion" on the border wall. Pathetic. McConnell has said that the McCarthy plan is dead on arrival and that the Senate will continue working on their plan to trade $1.6 billion in partial funding for full amnesty. Only a fraction of that $1.6 billion would actually allow new border wall construction. Most would go towards border patrol hiring, technology, and upgrading existing fencing. Pathetic. And they want to do all of this after the midterms. They want us to vote for them and then trust that they'll do the right thing... They want to trick us into voting for them so they can get away with surrendering on immigration. But they can't even keep the secret. Kevin McCarthy introduced the bill to fully fund the wall, which is exactly what Congress promised, and the Congressional leadership let slip that it's dead on arrival. You must authorize full border wall construction and give the President all of the tools and resources he needs to secure the border. The safety and security of the American people is not a bargaining chip. Your commitment is to the American people, not to illegal aliens. If you will not protect this country and its citizens, you will be replaced by someone who will. Move the bill forward now or else face the consequences!